| Healthy Living Articles | Food and Meals | Tofu, Your Kids Will Love! Looking to boost your kid’s nutrition? These healthy tofu nuggets are a fun, healthy and tasty kids’ meal or snack they’ll love! Help kids eat better by making good nutrition fun. Try involving your kids in both the shopping and cooking process! Even the smallest tasks, like dictating the shopping list for them to write and categorize, having them add the fruit or vegetable they pick out to the cart or scrubbing the fruit before it’s cut can help. 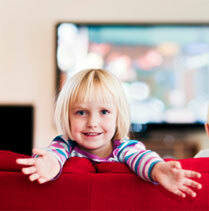 Kids love to copy their parents, so it’s important to set a good example for them by eating healthy foods regularly. Sit down for family meals rather than eating on the go! Together create a list of a few go-to-meals everyone can agree on. Assign kiddos easy tasks to set them up for success and build up to more involvement in the cooking process. 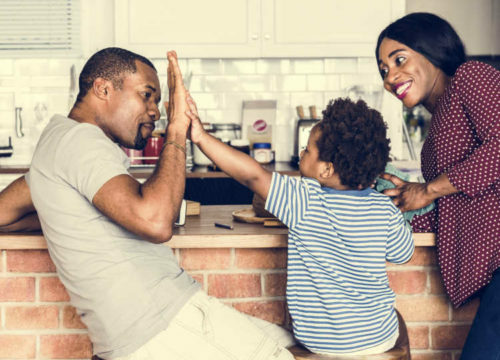 Starting with small steps is less overwhelming and being a parent is tough work – so make it easier on your self! Remember not to set your expectations too high regarding accuracy or neatness in the kitchen. Keep kitchen towels close by and a spray bottle filled with one part vinegar and two parts water for safe and easy clean up as you go! Make sure to always clean the counters before cooking, even if they look clean. See this video for a cost-saving eco-friendly way to clean. Use cooking together to teach kids what constitutes nutritious food and how it helps their bodies. Start with a simple recipe, like this easy tofu dish. Soy has phytochemicals that can protect against cancer. Learn more about how soy can be part of a healthy diet! For example, focus on strength and emphasize that healthy food choices like fortified tofu, builds strong bones and the whole grains the tofu is coated in, fuels them with long-lasting energy. This is better than focusing on calories or simply saying it’s good for you! 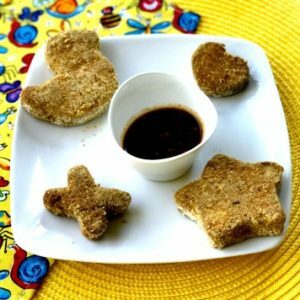 Cooking with the kids has never been so much fun as these easy tofu stars! Little kids as young as toddlers and even big kids like teens (although they may not confess to it) love cookie cutter shaped food. When tofu is cooked right, it can be delicious, taking on the flavors it’s combined with. It’s a great source of protein and disease-fighting phytochemicals. Bonus tip: make extra hoisin sauce and brown rice to use for chicken veggie stir-fry the next night and chop up extra garlic too! It’s so much easier to cook once and eat twice, or even three times as busy parents. See our Tasty Tuesday Kid Video on how to make these tofu nuggets and get the full recipe here.